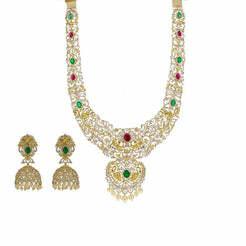 18K Yellow Gold Mangalsutra Necklace W/ White Gold Diamond Pendant & Double Bar Design for women. Add a special touch to your everyday attire with this single-strand 18K yellow gold Mangalsutra necklace with black beads and a white gold double bar pendant encrusted with 0.85ct VS-SI round brilliant diamonds. The chain is 16 inches long with a width range of 1-2.25 mm. The pendant is 23 mm long and 46.5 mm wide. 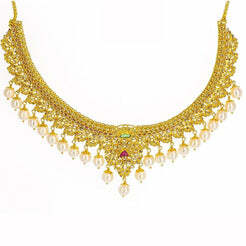 This elegant piece has a total gold weight of 8.3 grams.